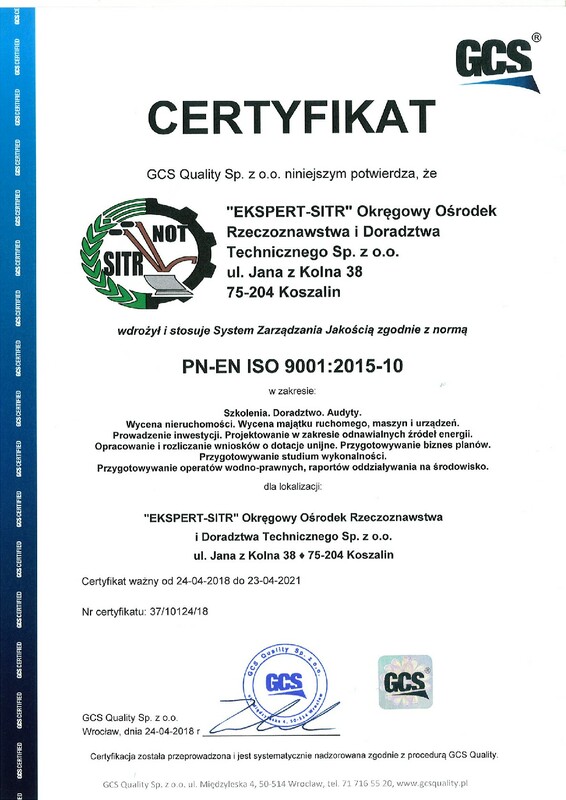 As a consulting company, EKSPERT-SITR LTD in Koszalin came into being on the 1st of March 1992. We develop such reports on the impact of projects on the environment with particular emphasis on projects related to renewable energy sources. We work with research institutions, agricultural advisory centers, experts from various fields. We develop technology and construction projects in the field of renewable energy sources adapted to the conditions and requirements of the investor and the resources held by him. We carry out projects co-financed from the European Social are called upon. The waste management plan for the region south and south-west of the Crimean peninsula, in the Autonomous Republic of Crimea, Ukraine. The project is in progress. Designed according to the recommendations of our experts Betting Waste Management is an investment priority in the Crimea and acquired the status of national project. Environmental impact report for the project "Zakład konwersji odpadów komunalnych na energię elektryczną i cieplną zlokalizowany na terenie gminy Wągrowiec". Environmental impact report for the project "Zakład produkcji paliw, energii, wyciągów ziołowych i innych produktów na terenie gminy Zapolice, woj. łódzkie"
Environmental impact report for the project"Budowa elektrociepłowni wytwarzającej energię z odpadów oraz zakładu produkcji paliwa alternatywnego na terenie gminy Świecie, woj. kujawsko-pomorskie". Programme and spatial concept, design and environmental impact report for the project "Processing system of ethanol, electric and thermal energy, and organic fertilizers production in Trzebiechów, Maszewo Commune, Lubusz Voivodeship". Environmental impact report for the project "Biomass energy production plant in Września". Environmental impact report for the project consisting in construction of sanitary sewage with connections in Gęstowice including pumping sewage to wastewater treatment plant in Trzebiechów, construction of sanitary sewage with connections in Trzebiechów and construction of wastewater treatment plant in Trzebiechów. Environmental impact report for the project "Reconstruction of the district road No. 0259Z Rościęcino ? Rzesznikowo, route: from the crossroads with national road No. 6 to Gorawino (length app. 6,7 km). Plan of waste management for the City of Kołobrzeg - updated for years 2009 - 2012 and 2013 - 2018 in prospect. Environmental protection programme for the City of Kołobrzeg - updated for years 2008 ? 2011 and 2012 ? 2015 in prospect.